It's not just floor space and bums on seats that can generate revenue. As the marketing manager of an event you offer a niche opportunity for the community you serve to come together and shop, network, discuss, and raise awareness. For this reason your event website, email communications, and social media posts all have a tangible and commercial value to many players in your industry. Using careful judgement and sensitive market awareness it is possible to make more of your unique position by allowing different elements of your brand’s online presence and communication opportunities to be sponsored for commercial return. We have listed below a number of the commercial opportunities that are available to marketers as a means of delivering a greater financial return from your event. There may already be areas of your physical event where you allow sponsorship, and in the more commercial world of B2B events this is a popular and developing area of the industry. It’s quite normal to brand your registration area, lanyards, meeting points, or theatres for example. However, you may not be so aware of the online spaces that are ripe for sponsorship. Firstly, though, don’t assume sponsorship couldn’t work for you event. In luxury sectors or academic and scientific communities, traditional where brand sponsorship could be seen as too brash for the target audience but sponsorship can be shaped to allow for subtle endorsement. Careful phrasing can be used to allow you to gain monetary or authority from a sponsor without the commercial arrangement appearing too obvious: Think “in partnership with”,”powered by”, or ”in association with”, all of which can raise awareness of a sponsor’s logo or name without being overly distracting to the event participant. 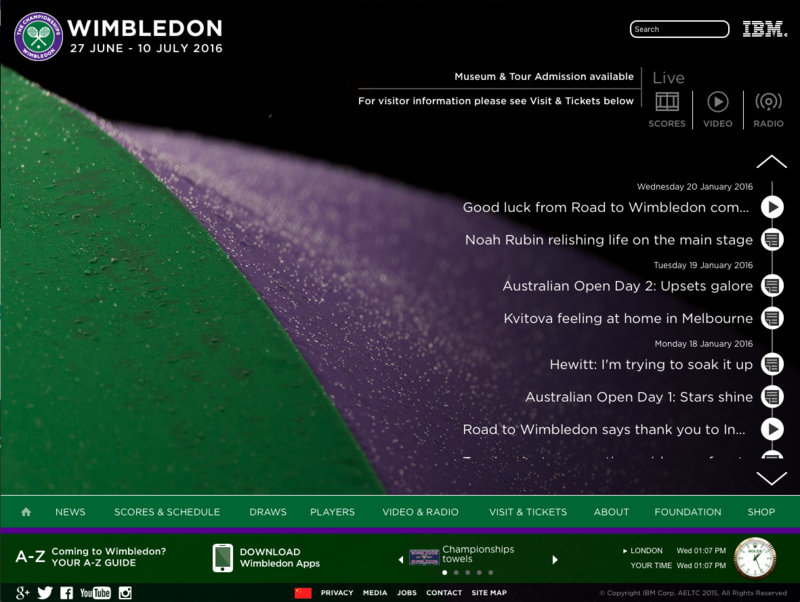 Below is an example from the British tennis tournament, Wimbledon, where the watch maker Rolex and hardware and software company IBM have had a long term relationship with the event and reflect their association through subtle logos descretely placed in the header and footer. Individual brands may have a natural affinity with certain sponsorship opportunities and it makes sense to try and align interests. For example a key industry publication would be well placed to sponsor a news feed or blog and equally your content gains credibility from the association. At brand-heavy B2B events in competitive markets it would not be inconceivable for every digital space we’ve listed to be separately sponsored but you can test the water with just a few opportunities and assess the reaction of your attendees as well as the success for your sponsors. This can also be a really useful way of paying for new digital development - An event app, “brought to you by X brand”, could end up being self-funding. Your event website is a key place online where your industry comes together. Providing display advertising on that website can be very lucrative, particularly in a competitive market where brands are jostling for the attention of potential clients. One of the great features of digital advertising for brands is that it lengthens the impact and return on investment they experience from your event from just the few days the event is physically open to weeks either side or longer if you have a year round presence. 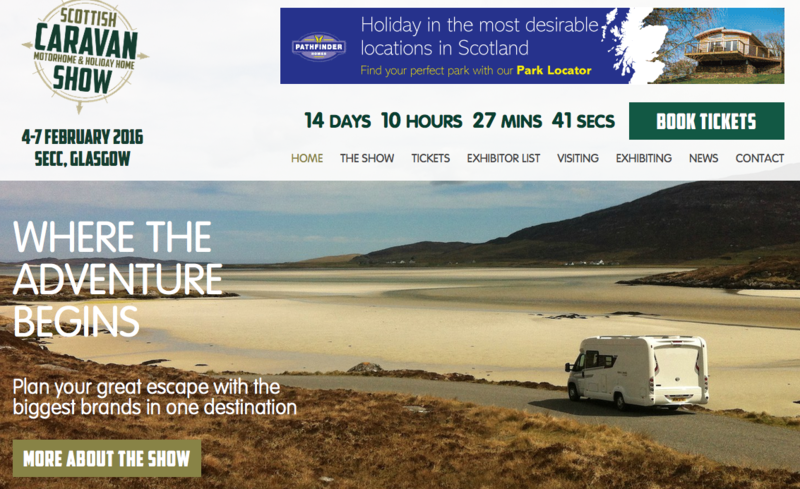 The key to a successful display advertising plan is to plan out a number of opportunities throughout the website. These display locations can initially be filled with inter-page promotions so that they do not look empty. Equally it may be worth putting up a classic sales message along the lines of “Buy this advertising space for a month for £1000”. When you set the value of each advertising space make sure that it is realistic to the size of the event and the volume of traffic that you could be sending through to a client website. A rule of thumb would be to consider each click through as worth £1 and then to consider a fraction of the traffic to that page as likely to click through. Although classic display advertising can be as low as 0.1%, your advertising is highly targeted and industry specific so a reasonable estimate might be 1% of that traffic. So how do you get started? Initially the best way to add display advertising to an event website is to use a simple graphic uploaded and included in the HTML, the success of which you track through Google Analytics. This enables you to have a very low cost of management and reporting for running the advertising as you try out this new revenue stream. If your event sells exhibitor stand space at around £2000 per stand then we would recommend you charge around £500 for an advert space based on a monthly cycle. Naturally you might tailor this to charge more around the event and less for other times of the year. It is also important to have a display adverting policy as to what you will accept. A rule of thumb is that the adverts need to be in keeping with the target audience’s expectations and feel a part of the editorial copy on the site. It might be that you want to offer a design service as part of commissioning of the adverting space so that you can ensure a consistent feel to the adverts. With significant peaks in traffic in the days around the event it can be tempting to implement Google Ads spaces on your event website to make a quick return. However, take care with this one. With little control over the types of advert that can end up being displayed in prominent locations on your site, this is a risky option, if a very easy one to set up. When it comes to selling display advertising, consider it like selling floor space in your exhibition hall. The same sales team selling stands will no doubt find it easy to adapt to selling display advertising and may want to package some digital advertising with the physical floor space as a sweetener to the deal. Creating sections of featured content throughout your website, and possibly your automated communications, is a great way of gaining some extra revenue and giving one company or speaker the opportunity to ensure they are noticed on your website. A good option for exhibitions and trade shows is to incorporate a featured exhibitor into each category of the exhibitor list who you promote prominently in that section. The opportunity to be the featured exhibitor for a category might cost the exhibitor an extra £250 but it guarantees they will be noticed when visitors are browsing the exhibitor list. If you have just 10 categories then it’s useful income to the event for minimal effort or management requirement. Once you have a couple of featured exhibitors you may want to promote these on the homepage in a rotation or in a side column on interior pages of the website to garner interest from others. Offering featured exhibitors can also be a diplomatic way of ensuring that your key exhibitors, who help finance the show through their involvement, gain greater awareness on the event website. In the same way that larger or more ambitious companies will take a larger stand space at your exhibition, likewise it is important that you have methods through which they can differentiate themselves online. With the website paying an every greater role in your marketing and visitor interaction with the event, being able to reflect the marketplace online can help ensure your bigger clients continue to support your event in future years. If your event is large enough to have a few hundred exhibitors then it can be helpful to exhibitors and financially beneficial to you to offer an enhanced exhibitor profile option. Unlike a featured exhibitor, which may be an exclusive opportunity occupied by just one exhibitor in a given category, an enhanced listing can be offered to all those who wish to take it. As with featured exhibitors, this can be a useful way of allowing the bigger players to differentiate themselves from the smaller: A company occupying your smallest 2x2 stand space are unlikely to opt for an enhanced listing whereas your mainstream year-on-year exhibitor, who is looking for a new angle this year, is more likely to take up this opportunity to help maximise awareness of their brand. The price point for an enhanced listing will probably be reflective of how much is charged for stand space and in the same way that a larger stand can allow an exhibitor to display more, so an enhanced listing might allow them to add richer information to their exhibitor profile. For example, an enhanced listing could allow them to list out their key products with images and descriptions whereas the normal listing does not have this feature. Consider making the point of difference visually in the exhibitor list through a shaded background or border to help visitors see which have an enhanced listing. As a hub for your community, your event website can be used to allow guest editors to publish paid-for articles on your website. Although careful moderation would be required, publishing editorial such as case studies or opinion articles in this space could provide significant commercial value to the author. They gain from the implied endorsement by your event brand in allowing the article to published on your website but you may not be aware that there is strong SEO value to be gained all round. Search engines have a map of the internet and the relationships between websites. Where a website that is seen as authoritative in a subject area has a link to another website it passes a kind of endorsement down the line. That link has value because it will help the recipient website rank better for organic terms which they may be targeting. Your event website will naturally have quite good authority in your industry because of the number of links it receives from from news editorial and company websites of those exhibiting at or who mention your event. You pass on this value to a guest contributor’s website if you offer a link as part of their article or case study. In short, editorial space on your website has real value that you can charge for or include as a benefit for larger stand holder but don’t just give it away without understanding its worth! Equally, your event website gains with the search engines by publishing this content. Regularly adding quality, relevant content cements your authority within the subject area and your site will consequently do better for searches around that theme. If you want to know more about how you can leverage your position as a subject expert, check out our guide to xxxxxx here. If your event is sufficiently established so that exhibitors have a year on year presence, you might like to consider developing an online directory of trade connections using the exhibitor list as the basis. Often the opportunity to fill out a rich exhibitor profile on the event website is missed by exhibitors who undervalue its promotional importance. However, with internet traffic an ever more vital marketing channel, link building and SEO are important considerations. With a strong event brand, a year-round online directory offers tangible value to the companies who list within it. The directory can also offer companies an opportunity to build awareness alongside the event without taking a stand. Consider that while you may have only a few hundred paid exhibitors, there will be thousand of consultants who attend your events and would like to promote themselves alongside it but are not large enough to take and man a stand. Besides having a value as another source of revenue, these online-only listings can be an incubator and future leads generator for the sales team. © 2016 NinetyOne Consulting Ltd. All rights reserved.